The big kids have all left for school already. Simon is about to head out the door and we are watching the clouds turn pink from our kitchen window. Every time I see the sky turn this color, I wonder what it looks like from the beach. One morning I’m going to go down to the beach and watch the sunrise. Most days I’m awake long before the sun comes up, which is not hard to do in the winter months in Aberdeen. But even so. In eighteen months of living in Scotland, I have not yet made it down to the beach for a sunrise. And so on this day, this halfway through the dark month of January day, I tell you, I am going to do it. This Saturday. I’m going to make a thermos of coffee, grab a pile of blankets and drive down to the beach to watch the sunrise. Why am I telling you I am going to do this? It seems like it would have been a better idea to do it, to take pictures and then to blog about it next week. Instead of blogging this week about an intention. But friend, I am choosing to blog about an intention to watch a sunrise because it has something to do with an intention for the year. I have been tagging my Instagram photos with the hashtag #ChasingDaylight as a bit of a teaser. Because I know that whatever else I do in 2015 that I want to chase the light. I want to be outside in the actual light, whatever light there happens to be in Scotland. And I want to chase the light that is in the world. The light that is shining within you and within me. And most of all I want to chase the Light of The World. Because if there’s one thing I’ve learned in my forty years on Planet Earth, it’s that if I’m not chasing Jesus, I’m going nowhere. Much like #48walks in 2014, I have not been sure how to launch this project. I don’t have a logo or a plan for the whole year. But I’m framing my year and my writing in #ChasingDaylight. It’s the narrative arc that is in my heart much like the story of walking was for me last year. So the real reason I am telling you that I am going to watch the sunrise this weekend instead of after I have already done it is that I want to invite you along. 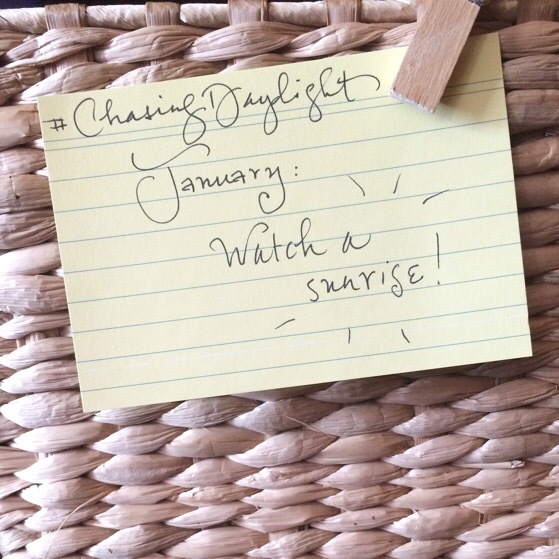 I want to invite you to the idea #ChasingDaylight and whatever that looks like for you. To make it even simpler than last year, I am not going to attach a number. Partly because I want to chase the light every day and partly because I want you to feel like you can do this for 2 days or 22 days or 222 days. I’m hoping to come up with at least one challenge a month that you can join in on if you want. They will all involve getting outside. There will still be lots of walking. Of course, you can make up your own #ChasingDaylight challenges. Or you can just watch. Because you probably already have a lot of challenges happening in your life. Since January is halfway over (can I get an AMEN? ), I’m making this month’s challenge super simple. Get outside and watch the sunrise from somewhere fun. And just like last year, you can participate any way you like. Leave me a comment saying: I’m chasing the light with you this year! Or tell me on Facebook or Twitter or Instagram. If you blog about #ChasingDaylight, link back here so I will know and then I will share your post in my weekly-ish links. Here’s to getting outside, even in the winter! Love this idea. I’m in!!! YAY!! I can’t wait to chase some daylight with you SUPER SOON! I’m chasing the light with you this year! Yes! Must get down to the beach for a sunrise! Been thinking about it for months… now have no excuses. Great idea!! Maybe I can join you some!! And I need to continue more fervently in chasing Jesus and growing in my walk with Him!